This frigid weather has given me a perfect excuse to spend some quality time at my sewing machine. Earlier this week I finished my Crosses and Losses quilt top! Chain piecing the remaining 24 quilt blocks was a good idea. I think it took me about three days to finish them - much faster than the first 18! These blocks finish at 8" x 8". I sort of wish I made 12" versions for a slightly larger quilt. But since this is for my daughter, I suppose the smaller size is okay. There were a lot of points to match up when I sewed the tops together. I took the extra time when I was pinning to make sure everything was aligned properly. I braved the 5 degrees to get a few pictures in the snow. 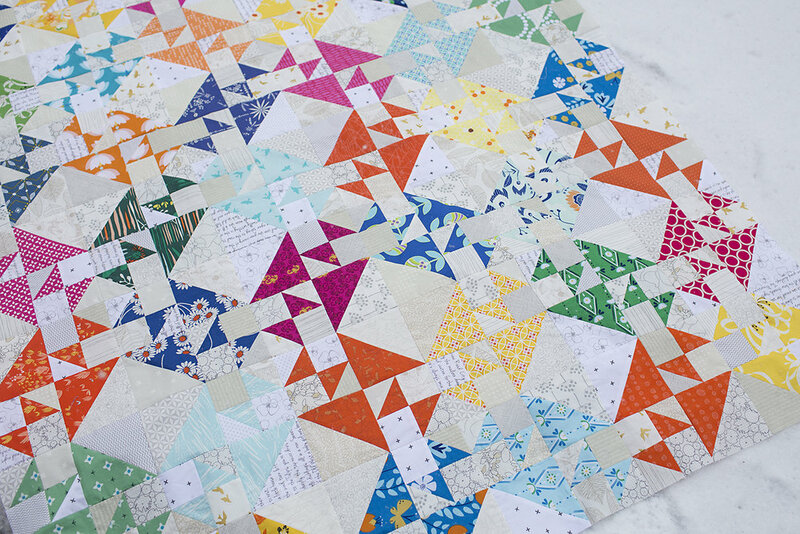 I love the pop of the brights against the low volume background (fabric and snow)! I think my daughter wants minky for the backing. That should make this quilt nice and warm for cuddling on the couch with her Nancy Drew.